Size 5, 6, 7, 8 or 10 whole sizes only. Please request ring size by choosing from the drop down menu at the top of the listing. Stainless Steel Ring with Yellow Gold Plated finish embedded with top grade mini crystals in clear. The back of the ring features the same design without the crystals. This ring features a crystal embedded heart in the front and a gold plated heart on the back of the ring. Ring measures about 5/8" wide in the longest front portion. We recommend a size larger on this ring due to the width. 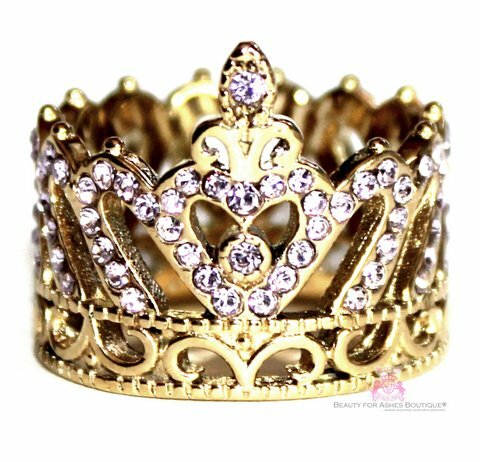 Just type in Beauty for Ashes Crown Ring in the search box.